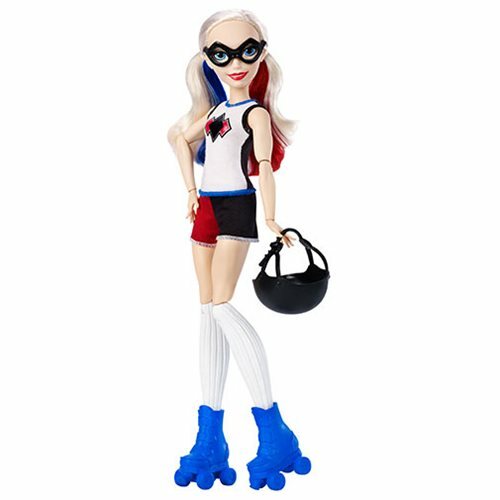 Shopping for Harley Quinn Dolls? Get ready to roll into action at the roller derby! Now you can join the team with Harley Quinn for some fast rolling, rink bashing action. Harley Quinn stands about 12-inches tall and comes with shorts, a tank top, and socks designed in her signature colors and with iconic logos. She is also outfitted with wrist guards and come with removable roller skates and helmets to keep her safe during their fierce roller derby matches! For even more roller fun, collect all the other characters like Wonder Woman, Bumblebee, and Batgirl (sold separately)!